One of my favorite things about Lexington’s music scene is the way that so many musicians are determined to work together. They play in each other’s bands, they record on each other’s albums, and in the case of Signal Delayed, they put out albums together. In preparing for this write-up, I spoke to Scott Whiddon of Palisades, who said: ‘For me, this project represents everything I wanted Palisades to be: community, collaboration, creativity.’ Make no mistake, I wont pretend that Lexington is the only city where musicians are nice to each another – I’m just grateful, because I imagine that not every city is so lucky. 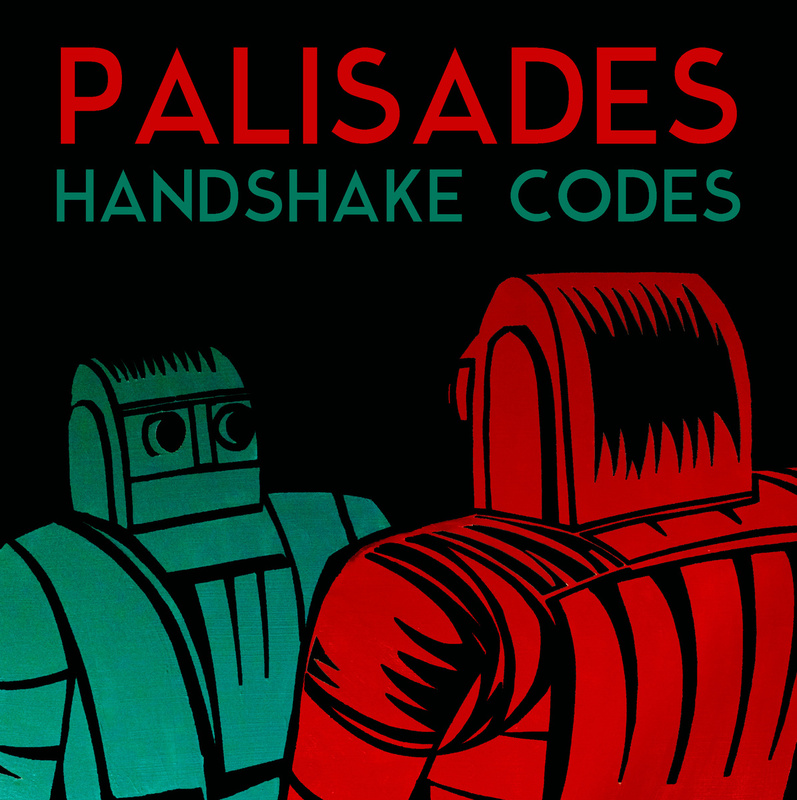 The first side of Signal Delayed is a pair of power pop songs from Palisades. The first of which, “Pretty Thief,” is familiar sounding (if you’ve listened to Palisades previously) – it’s full of bright guitars, a super quick and catchy chorus, and uses every bit of its runtime for something a little different than what came before it. “Tough Shakes” is a fair bit grungier and moodier than the more sugary pop that Palisades have produced in the past. Most of the lyrics of are more spoken than sung, the guitars are weightier than usual, and the lyrics have a little more bite than usual. That said, the production on these songs is at a place I haven’t heard from Palisades before – all the instruments are rich, well-balanced, and crystal clear (plus, the organ sounds on “Pretty Thief” adds a nice bit of light-hearted texture). As far as I know, this is the first new recorded music from Big Fresh in a good while (since Moneychasers came out in 2011, maybe?) In case you’re not familiar with Big Fresh, it’s a long-running collective of musicians fronted by John Ferguson that has been around since 1998. The songs on the second side of Signal Delayed are funky, synth-heavy, and sci-fi flavored. “Atlantis” is quick, but punchy and in your face with a buzzing synth in the front of the texture and echoey vocals singing things like “we launched a rocket in space, we blast a hole in your face.” “Night Driving” is the perfect foil to the song preceding it – the quiet, low-key groove of the chorus is much more mellow and has the perfect feel for a song about driving at night. The many members of Big Fresh are orchestrated richly on this track, with horns and keyboards imitating vocals, a very well-chosen soundbyte, and drums helping to direct the song through its course. If you’re a lover of Lexington music, it’s a no-brainer to find yourself a copy of Signal Delayed. It’s two great bands (whose collective members are likely in ten or more bands between them), four great songs, and I hear it’ll even be available on red vinyl! You can pick it up when you see both bands this Friday at The Green Lantern, or grab a copy the next time you stop by your favorite local record store. Tracks I Liked: Pretty Thief! !, Tough Shakes!, Atlantis!, Night Driving!! Written by bensouthworth Leave a comment Posted in Albums, Ben, Reviews	Tagged with 7", big fresh, electronic, john ferguson, kentucky, lexington, palisades, pop, power pop, scott whiddon, signal delayed, split 7"
I’ll admit it: power pop isn’t a genre I’m thoroughly conversant in, but it is one I’ve gained appreciation for over the last eight months or so. During that time, I’ve been doing a show called ‘State Songs’ on WRFL – one that plays music from a different state each week. People insisted that Big Star was a must play for Tennessee (they were right), and I’m sure that the dB’s will have a spot on the episode about North Carolina. The thing is, though, that Palisades are starting to sound less strictly like a ‘power pop’ band – at least here on Nervous Habits. Nervous Habits is a four-song EP that just eclipses the ten-minute mark, much like Handshake Codes that came out a couple Septembers ago. Like that preceding EP, the songs here are concise (maybe that’s appropriate, given that lead singer and guitarist, Scott Whiddon, directs the writing center at Transylvania University), but are perhaps a little more experimental. The lead-off track, “Burn the Maps,” is a fast-paced track with just a little bit of organ held over at the end (was that buried in the mix the whole time?). “Maybe We Can Just Hold Hands” with its soft-spoken background ‘ahhhh’s’ and nearly twangy guitar interludes feels like it’s channeling at least a little Jeff Tweedy, but does so without losing the feeling that it’s a Palisades song. “Poor Holidays” is the first track on the backside of the EP, is a bit slower than the first two tracks, and the lengthiest of the release. The more laid-back tempo is a good thing, giving the mix a little more room to breathe – you can hear some double tracked and background vocals, and the distorted, reverb-heavy guitar solo stands out as one of my favorite things I’ve heard on a Palisades song. The EP is closed with “Careless,” a song that starts with the line “call in the reserves, I might need some help,” and ends with exactly that as friends of the band – including the likes of Dave Cobb, Joe Drury, Coralee, Robby Cosenza, John Drake – help sing on the final run of the song’s chorus. It’s worth mentioning, too, some of the behind-the-scenes work that made this EP sound the way it does. First, the album was recorded at Shangri-La with J. Tom Hnatow, who was largely involved in the creation of last week’s album released by Small Batch. John Ferguson (Big Fresh, Apples in Stereo, and ATTEMPT) mixed the album, and we’ll be hearing a split 7″ record from Palisades and Big Fresh in the spring called Signal, Delayed. The album cover was created by Neil Bell, the band’s drummer, and is one of my favorite pieces of album art from a local band in a little while. Nervous Habits is not only a good release, it’s my favorite from Palisades thus far. It is everything that a four song set of power pop songs should be, but it also proves that the band is modestly experimenting and doing new things, trying out new sounds. It’s some growth that I earnestly hope to see continue for Palisades, and a trend that has definitely paid off for them here. Tracks I Liked: Burn the Maps!, Maybe We Can Just Hold Hands! !, Poor Holidays!! !, Careless! Yeah, this review is way late, (I know, I’ve got a lot of catching up to do). Palisades are a band who have effectively stitched themselves into the fabric of Lexington music as one of those bands that most everyone knows about to some degree. They’re made up of three guys who play really well and – perhaps more importantly – know how to work within a music scene like the one in this city. The members of the band are constantly finding ways to collaborate with other musicians in town, and they make posts on social media about other band’s concerts as often than they do for their own shows. In a musical and cultural landscape like the one found in Lexington, this is an extremely healthy thing, and goes a long way in helping everyone. So the music? The EP is the first of three planned releases for 2014/15 from the band, and features four snappy, catchy rock songs that come in at just about twelve minutes total. “Anecdotes” starts off with a driving guitar riff, and wastes no time getting to the lyrics, before reaching a pulsing chorus and a great guitar solo. The second track, “All Hands on the Take,” is stocked with another catchy solo, guitar embellishments and great breakdowns between sections of the song. Flipping the record, you start out with my favorite track of the EP, “Parlor Games/Party Tricks.” The song starts off with a lone strum of a chord, the first couple lyrics, and then straight into the track – this song has a really nice bridge, and an awesome coda (not to mention my favorite guitar tones of the entire release.) The final track, “Pedal Sassy,” is an instrumental track, but is every bit as catchy as the songs that preceded it – as a final track, it pulls things together very nicely. The audio production on Handshake Codes is great, which is no surprise, when you know that J Tom Hnatow and Duane Lundy of Shangri-La produced and mixed it, respectively. The songs are tight, well-rehearsed, and have a great polish to them that shows off the drum and guitar work of Neil Bell and Mark Richardson put into it. Scott Whiddon’s experience in Transylvania University’s Writing Center shows here – his lyrics are clever, calculated and delivered with confidence and nuance. If you’re a fan of poppy rock songs that get right to the point, this record is a must get – you should be on the lookout for the two follow-ups that these guys have planned for later this year, too. Tracks I Liked: Anecdotes!, All Hands on the Take! !, Parlor Games/Parlor Tricks!! !, Pedal Sassy!